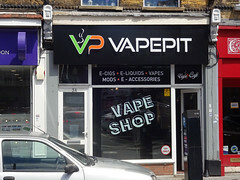 Vape shop on South End in South Croydon. It opened some time in the first half of 2016. It's part of a small chain which expanded from an original shop in Wallington. The building was previously occupied by a secretarial services provider called The Secretary. As of August 2012 it was vacant photo and had been sold on behalf of receivers. In March 2013, planning permission was granted for use as a hot food takeaway, and by July 2013 it was open as a cafe called Yummy photo. As of July 2013, signs in the window advertised items such as hotdogs, waffles, and zapiekanki (a Polish snack, sort of like a French bread pizza). As of October 2013, a sign in the window noted that it was cash only. Yummy closed down some time between April and July 2015, and the premises then remained vacant until at least December 2015. Last edited 2019-02-07 14:45:18 (version 28; diff). List all versions. Page last edited 2019-02-07 14:45:18 (version 28).